The enthusiastic experts here specialize in the bittersweet, aromatic liqueurs. WHO KNEW THAT Seattle is home to “Nirvana for amaro geeks?” In the book “Amaro: The Spirited World of Bittersweet, Herbal Liqueurs, with Cocktails, Recipes, and Formulas,” published last year, Brad Thomas Parsons names Barnacle in Ballard one of three places in the country for extensive inventories of bitter bottles as well as friendly help in demystifying the world of amaro. Several years ago, most bars would carry nothing more than Campari and Fernet-Branca. But recently, with the trend toward bitter cocktails, more amaro from Italy has become available in the United States, and domestic producers have been popping up. Now it’s common to find an entire row of amari at your neighborhood bar or liquor store. At Barnacle, the entire bar is dedicated to Italian amari. Even though Barnacle’s been open three years, Little still is asked what amaro is. 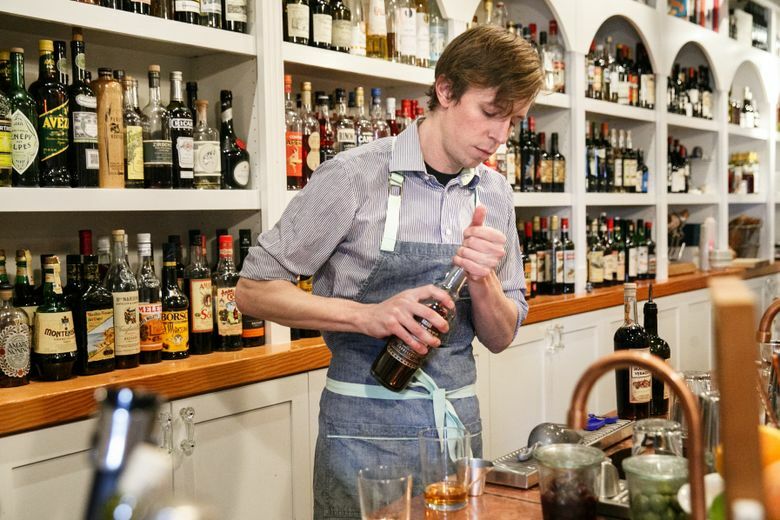 He enjoys teaching customers about the different flavor profiles and amaro-producing regions. For those eager to taste and learn, Barnacle offers flights of four half-ounce tastes for $11 to $15. So, for those who still aren’t sure: Parsons defines amaro in his book as, “the collective class of Italian-made aromatic, herbal, bittersweet liqueurs traditionally served as a digestif after a meal.” It is made from bitter barks, herbs, spices, citrus peels and other botanicals, combined with a neutral spirit or wine and sugar syrup. Amaro is a category without clearly defined boundaries, Parsons writes, with a rich history that dates to medieval friars and monks in abbeys and monasteries across Italy. Bitter tonics originally were used for medicinal and restorative purposes. Without strict classification, amaro is known in general styles, from light and citrusy to dark and medicinal. Subcategories include fernet (very bitter, higher in alcohol), carciofo (made with artichoke), rabarbaro (made with rhubarb) and tartufo (made with black truffles). • Amaro Meletti, from the Marche region. A good gateway amaro: grain-based, light and floral. Enjoy it on the rocks with an orange twist or in a spritz with prosecco and club soda. • Amaro Nardini Bassano, from the oldest grappa distillery in Veneto. Pairs well with chocolate and coffee. Also great with rye or mezcal. • Amaro Sfumato Rabarbaro, from the Cappelletti distillery in Trentino-Alto, near the Austrian border. Scotch meets amaro. Very viscous. Makes a great smoked rhubarb old-fashioned (see recipe). • Fernet Florio, from Sicily. There isn’t a prettier fernet. More elegant and elevated than most. Made from aloe, cardamom, saffron and mint. Serve it on the rocks or in a black Manhattan. In his book, Parsons writes that the key to the amaro culture is the idea of hospitality and ritual: “It can symbolize the transition from workday into evening and serve as a soul-warming digestif.” No matter how you enjoy it, a centuries-old history is in each bittersweet sip. 1. Combine all ingredients in a glass with ice, and stir. 2. 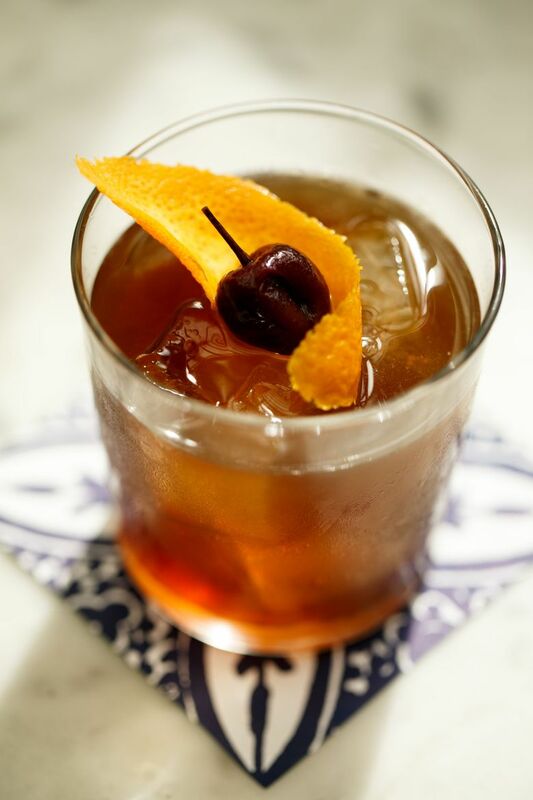 Garnish with a cherry and orange twist. Catherine M. Allchin is a Seattle food writer.